You can customize the lighting for your games without having to rely on the default backgrounds for light sources. Combined with Assetbundles, you can create some fantastic lighted scenes with various moods and hues. Light Intensity – Use the slider to change the intensity of the light shining from above. Do you want it to darker or lighter? This also affects the strength of the shadows. Light Color – The color you choose with the color picker will affect what your light looks like shining from above. Ambient Intensity – For the Ambient Intensity, you can choose how strong or light you’d like the ambient or “mood lighting” to be. 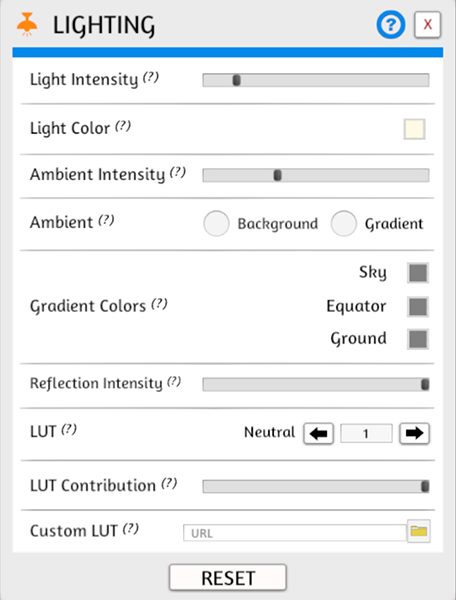 Ambient Light – You can choose between one of the default backgrounds for lighting or customize it further by choosing the Gradient option. This allows you to choose 3 colors to give more ambient lighting choices. The gradient colors only take effect when you choose the Gradient option. Reflection Intensity – This slider will effect how strong the reflections are on shiny objects. LUT – Choose from 115 different options to make even bigger changes to your lighting and atmosphere. You can read about LUT here. LUT Contribution – This slider changes the intensity of your LUT. By default, it is at max setting so you can see it at its strongest. Custom LUT – If you know how to make your own LUTs, you can upload a custom one to use. Just make sure the dimensions are 256×16.